It "looks" like another day of migraine weirdness today. I awoke with a developing scotoma, all gray, no scintillating outline, which is unusual for me, but it started as a small spot in the center of my view field and over the interval of about an hour, gradually grew to cover about 90% of my visible area, then over the next five minutes or so, cleared up and disappeared. All that is left now some three hours later is a small fuzzy purple disc in the very center. 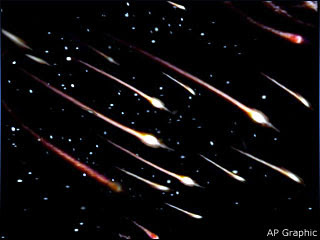 I have also experienced some spectacular meteor showers -- or that is the best characterization I can compare to. My personal meteor showers seem to be multi-color displays, a rather pure red and green hue, and a kind of mercuric quicksilver that all leave a long-lasting trailing afterimage several seconds. They start as a single bright spark in periphery somewhere, appearing to be in the background rushing toward me at a terrific rate. The apparent object then undergoes transformation into a bursting effect and forms many smaller sparks, which also fission into smaller sparks, and so on, until my field of vision is filled with a plethora of fiery glittering sparks streaking toward me at a tremendous rate. They describe a perfect parabolic curve and miss me, disappearing out of the visual field as they pass beyond my peripheral view. I only wish there was a more effective way to share some of the beauty I see in these experiences. It is quite spectacular -- in a lonely, self-centered sort of way. The beauty that sometimes erupts with some pain or other experiences that resemble pain has at times caused me trouble seeing differences between suffering and ecstasy. I can't imagine going through he difficulties you have experienced. The fact that you are still here speaks volumes to your strengths, and your ability to overcome. It may not look like that to you, but that's what it looks like from my pampered perch. We work things out, just the same way as my ancestors did. I have a far more supportive group to back me up than they ever did. Look at this link, for example: "http://www.youtube.com/watch?v=sNa_F0Ybhxw". Can we ask the Lords blessings if we sacrifice anything less? Please do not make the mistake that some do. Suffering creates the humility and open-minde attitude which is condusive to teachability, but I woul argue that it is not the only wayto approachability. Nay,I think there are ways you and I know -- WE KNOW FOR A CERTAINTY -- that there are other circumstances just as conducive to effective sacred instruction. Please read Elder Holland's talk about Joseph and the brethren in Liberty Jail if you have misgivings. What makes the experience holy and sacred is not privation and suffering, but the sanctification of the spirit. Mind, many suffer, but never are sanctfied. There,I have gone and made a profound assertion. Now I need togo and consider the import. Please do not make the mistake that some do. Suffering creates the humility and open-minde attitude which is condusive to teachability, but I woul argue that it is not the only wayto approachability. Don't worry, Jim. I won't make the mistake of believing that suffering is the only way to experience the mighty change of heart. Sometimes it seems that there's little or no difference between the kinds of wonderful things you learn from suffering and the wonderful things you learn from joyful circumstances that lead to breakthroughs in your understanding. That's all I was trying to say. I've learned lessons from what's commonly called suffering that are as beautiful and awe-inspiring as some of the ones I've picked up from rapturous moments where human nature reveals its sacred nature or from some other set of circumstances that gives you a glimpse into the eternities. Jim, I have experienced some pretty wierd things with my migraines as well. I have been fortunate to only have problems during pregnancy - which I can assure you will not happen again! However, it is possible another hormonal surge in my life will bring them on. One of my favorites was a tingling that started in my thumb, traveled down my thumb then up and down each finger, entered my arm, and disappeared by the time it got to my shoulder. I guess the whole process took about 10 - 15 minutes. Interestingly enough, it happened the same each time I got a migraine (first double vision for about an hour, then the tingling in my hands, inability to form the right words when speaking, and so on). The headache didn't start for 30 - 60 minutes. I saw some pretty great light shows too, but not like yours. Thanks for scanning in the letter from the doctor, I really appreciate that. Not everything you see is as simple as simple "migraine weirdness". You need a visual field test. Go back to Dr. Digre, and don't wait. I am getting another MRI scan in two weeks following with the Neurosurgeon. Pretty certain the prognosis already -- had another stroke or TIA. Hate hospitals enough that I elected not to go back for that. They can't do anything about it. New brain damage should show up on the MRI. My brain is dying piece by piece. While it holds, I'll do my best. BTW, as far as I can tell, Tina the lovely nurse never tried to contact me. Should I give up and leave her alone, or keep trying? I know I look like a foolish old man, but what do I risk? What do any of us risk? You have to decide whether it is worth your time and effort. Some things are, and some things aren't. Some times we know we're beating our head up against the wall, and sometimes we do it anyway. Who can say what is right and what isn't? I'm certainly not the judge of your decisions. The question was rhetoric. I guess I am to sleepy. What I meant was I risk losing dinner out with a charming, witty girl who could hold her own in a conversation with us. Most could not.